It’s official. This week shall hereby be known as the Five Days of Felted Friends. I can’t seem to stop felting this week. Remember when I illustrated knots from that giant reference book for a week straight? I’m on a similar kick. 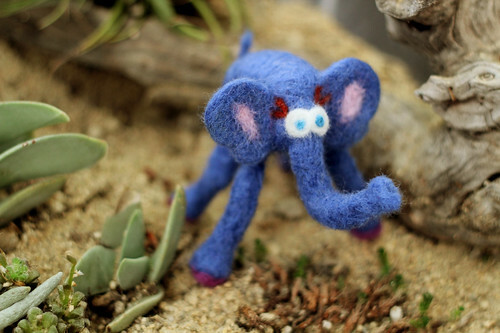 Today, the new felted friend, is a baby elephant. 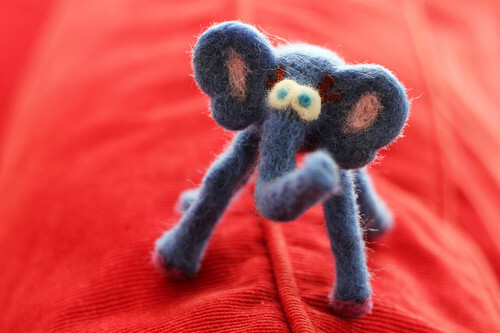 I got a phone-in request to felt an elephant on the same day that a friend told me elephants are “important” animals in my life. With a grain of salt, I figured all signs pointed to pachyderm, and got to work. 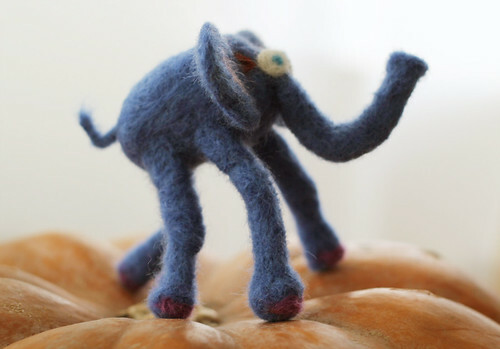 For the body of the elephant, I used the baby bird from my first felting project. know, please do not tell mama bird, but I needed the wool roving. 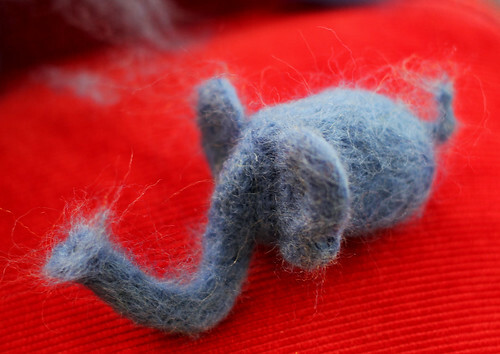 I wrapped up baby bird with a bit more blue wool, and made a bean-shape for the elephant body. Creating two flat, heart-shaped disks, I attached the ears. After working a curve and small depression into what resembled a blue dreadlock, the trunk took shape. Once a tail was added, I grew excited to meet my new friend. 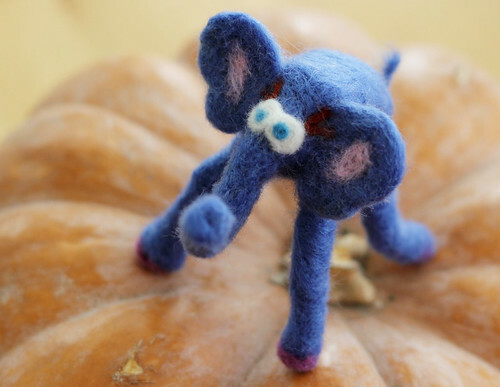 After trying out a few different styles for the eyes and adding lashes the elephant’s personality began to take shape. With the long gangly baby-legs in place, my elephant friend was complete. He started out a bit wobbly, but was soon exploring every inch of the house! 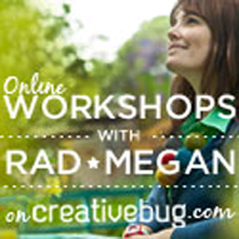 Thanks for indulging me on this creature-creating kick. I’m having so much fun creating these friends, that I would hate to part with them, but there’s an awfully good chance, they will be for sale soon. 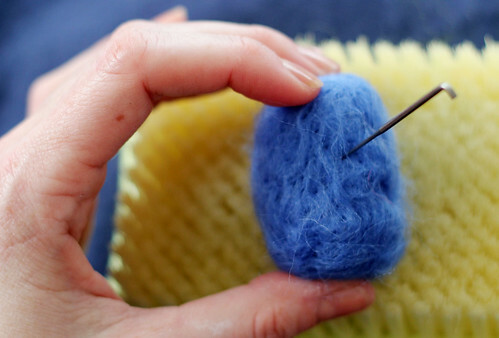 Only two days left in Five Days of Felted Friends. 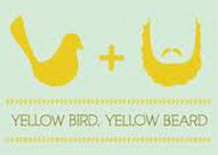 Get your requests in now if you would like to see your favorite animal here! 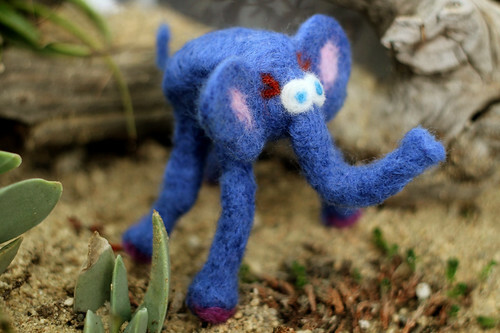 Your felted animals have so much personality- it’s great to see them evolving! 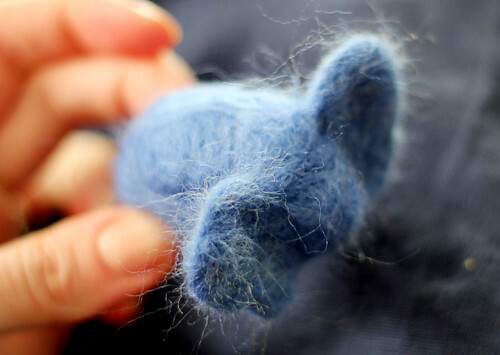 I think you need to make a felted fancy rat! Farrah- All fab ideas! 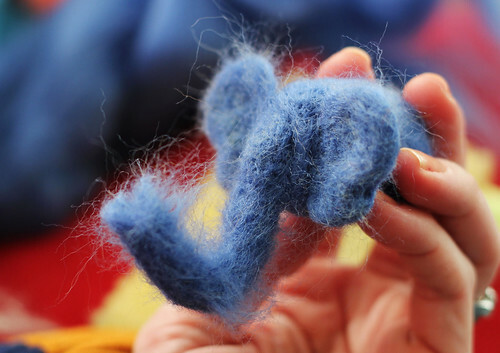 I’ll have to squirrel those away for the next time I do a week of felted friends… oh and speaking of squirrels! Anonymous- I don’t know you, but I like your style! Octopus wins! Ashley- is that one of your rats?? Very cute. I will put that on the list for next time. make a vid like u did with the octopus!!!! !